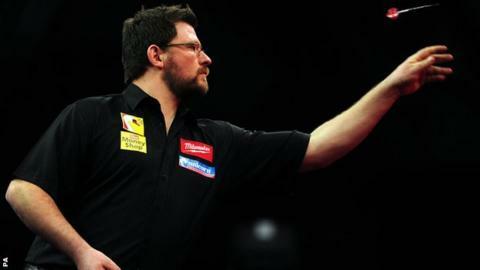 World number three James Wade reached the PDC World Darts Championship second round with a 3-0 win over Peter Hudson. The 29-year-old, who has reached two semi-finals, dropped just two legs. "It wasn't my best performance but I got the win and I'm relieved to get the game out of the way," he said. Qualifier John Bowles beat Jamie Caven 3-2 in the most entertaining game of the night while Peter Wright beat Arron Monk 3-0 and Welshman Mark Webster overcame Ian White 3-1. Wade lost 6-5 in the semi-finals last year after blowing a 5-1 lead to champion Adrian Lewis, who won 10 successive legs. But the World Matchplay finalist, who will face Steve Beaton or Australia's Kyle Anderson in the next round, insists he can win the title. "Some people are not considering me as a contender in this tournament but I'm a very capable player and that means that I can take the trophy," he said. Bowles beat Carlos Rodriguez in the preliminary round before his thriller with Caven. He won the first set before hitting a bullseye in the fifth leg of the fourth set to take it into a decider. And Bowles held his nerve to win the fifth set on a tie-break to knock out a player ranked 64 places above him and set up a second-round clash with fourth seed Gary Anderson. Wright hit checkouts of 140 and 126 in a comfortable win over youngster Monk. "I felt a bit sorry for Arron, he's a much better player than what he showed tonight," said Wright. "I took my chances and got the job done, and it's good to be into the tournament now." Webster should have also won in straight sets but missed eight doubles in the third set against White before finishing the job in the fourth. Has Taylor finally lost his Power?